I decided I was on the west side, which was the right side to be on. I left at about 9:30am, having slept a lot to make up for the previous night. It took me about two hours to get up, make porridge, pack and get going, but this was my first time doing it alone and I did cut that down to about an hour and a half for most of the rest of the trip. 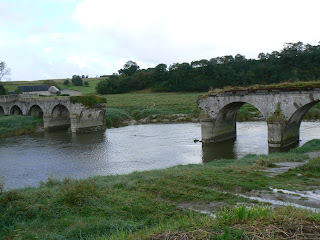 There was a broken bridge at Pont de la Roque, destroyed during the Second World War in an attempt to cut off the Germans. I started to notice signs to town campsites, which I hadn't really done on Monday but decided it was good to get into the habit. I got my pain au chocolat, and had one for dgym too. The weather was very changeable, the very definition of "sunny intervals". My raincoat stayed on as it wasn't too hot, but the hood was constantly up and down. I spent most of the day watching the skies. When it was sunny, I kept a suspicious eye out for grey clouds. When the grey clouds came along and rained on me, I would scan the sky hopefully for the tiniest blue patches. I slipped in the gutter at le Repas, the bike fell (not that it has far to fall with its wide load on the back), I stayed on my feet but a passing motorist seemed to find it amusing. Lunch at la Haye-Pesnel consisted of sheltering under a dripping tree in the town centre with bread, jambon sec and cherry tomatoes. 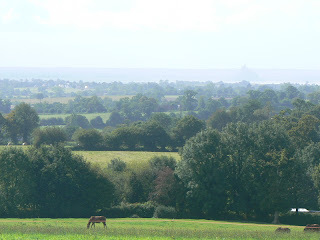 My first glimpse of Mont St Michel came during a sunny spell near Lolif. 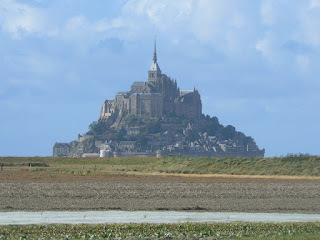 I didn't want to go into Avranches as it looked too big, but it stood between me and my Mont. I skirted past the town quite nicely, thanks to the impressive signage on the little roads in Normandy. I followed the on-road cycle route from Pontaubault, mostly on coastal roads so the approaching Mont was visible a lot of the time. It had been reasonably sunny for a couple of hours, so I had dried out a little, but was suddenly hit in the face by stinging, cold head-on rain, which might possibly have been hail. It was getting close to the time to start setting up camp but I was nearly there, so battled on. I reached the "base" of the Mont (the inland flashy neon tourist settlement of hotels, restaurants, a campsite and a supermarket) soon enough. After putting the tent up, I decided to eat out while the opportunity was there (some might call it avoiding my own cooking) and had a three-course meal at one of the restaurants, consisting of oysters, steak and chocolate mousse.